Afloat on tranquil backwaters, this is an offering of a three-bedroom houseboat, which can accommodate up to nine people. 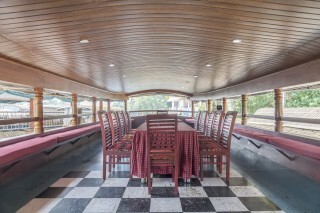 Offering the service of a chef for freshly prepared meals on board, this retreat ensures you have a convenient experience with your family. 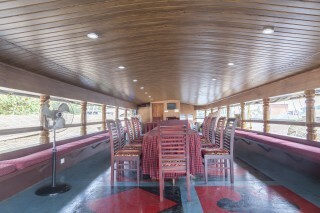 Your Space Inside its classic exterior this houseboat boasts contemporary furnishing and is designed to provide modern comfort. 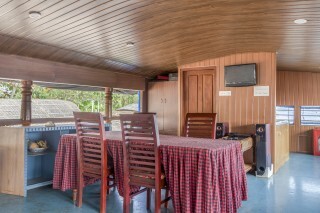 The dining area is appointed with a table to enjoy comforting meals in the company of family or friends. 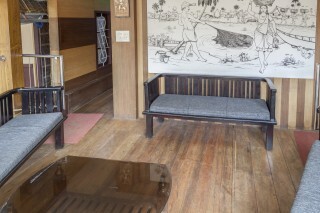 The sitting area is furnished with a couple of sofas and a glass-topped table. 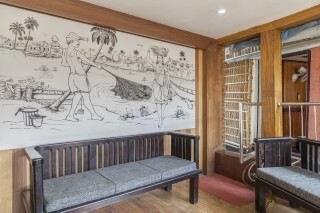 The room on offer is air-conditioned and occupied bya cushy bed for sound slumber. A couple of side tables and a mirror for convenience. Places to visit: Munnar Town in India Munnar is a town in the Western Ghats mountains in India’s Kerala state. Munnar, a hill station and former resort for the British Raj elite, is set within rolling hills dotted with tea plantations established in the 19th century. Periyar National Park Periyar National Park and Wildlife Sanctuary is a protected area in the districts of Idukki and Pathanamthitta in Kerala, India. It is notable as an elephant reserve and a tiger reserve. Eravikulam National Park Eravikulam National Park is a 97 km² national park located along the Western Ghats in the Idukki district of Kerala in India Marayur Town in India Marayur or Marayoor is a town in Idukki district of Kerala, India. 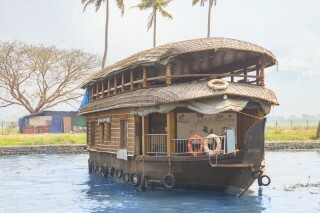 It is located 42 kilometers north of Munnar on SH 17 connecting Munnar with Udumalpet, Tamil Nadu. Kumily Town in India Kumily is the largest Grama panchayath in Kerala.Kumily is a town in Cardamom Hills near Thekkady and Periyar Tiger Reserve, in the Idukki District of Kerala. Alleppey Railway Station is just 4 km away. Cochin International Airport is nearest International Airport and is around 83 km away.